Our growers have come up with a creative way to appreciate our beloved native Forest Pansy Redbud tree in a whole new way—they’ve espaliered it! Like a mural painted by a master artist on the side of your home, this specially shaped ornamental tree will dress up a blank wall with glorious color and draw oohs and ahhs from your guests. We think it’s even better than a painting, though, because this mural changes throughout the year, depicting delicate lavender-pink flowers in spring, ruby-red foliage in summer, and butterscotch and gold tones in fall. And the show only gets better each year! Many normally green-leaved plants have at some point spawned a red-leaved variant. Redbud joined this club when a maroon seedling appeared in a crop of ordinary trees at Hiram B. Stubblefield’s Forest Nursery in Tennessee in 1947. The French term espalier (ess-pal-YAY) stems from the Italian word spalla, or shoulder. Plants so treated were thought of as resting their “shoulders” against the wall. The ancient craft of growing trees in this form has long been used on grapevines and on fruiting trees, but training Redbuds this way is relatively new. An espalier is the perfect way to add some beauty to a small space. Have the ability to admire the lovely purple-pink Redbud blooms in spring and deep purple foliage throughout the summer on this spectacular specimen! Use this Forest Pansy espalier along a wall, along the side of the house - even as a living fence... you're only limited by your imagination. Redbud’s herringbone branching pattern and the way it flowers on naked stems make it a flattering subject for espalier treatment, and the rich purple-red leaves help maintain interest all season. Espaliered trees are not plant-it-and-forget-it trees, but the maintenance involved can be quietly meditative. You’ll want to trim back branches that stray too far, and then nip the remaining stems to encourage fullness. You’ll be rewarded soon afterwards with fresh ruby-red foliage. Don’t prune after July, or you’ll remove flower buds. A sunny site with moist, well-drained soil is best. Am I supposed to keep the Trellis attached to the Tree? If and when can I remove it? The primary purpose of the Trellis is to provide the form for training. Much of this is accomplished on the Nursery, however, for a few growing seasons there may be a need and benefit to leaving the Trellis in place until the Tree calipers heavily. We intentionally made the Trellis attractive for this purpose. It also serves to provide the desired effect until the specimen fully forms. We recommend removing the Trellis in two to three growing seasons or when desired. How do I care for and prune the Espalier Forest Pansy? The Espalier Forest Pansy will require annual prunes. Like Topiary or Bonsai pruning, the main structure needs to be maintained as the Tree will force branching and work to return to its normal habit. A few prunes a year will help keep the desired form. You should prune in the Spring at flowering time - when flowering is near the end. This is the ideal time for the first prune as it is before the leaf break, allowing you to see the structure of your Tree. Remove all undesired branching, cutting it back to main form structure. We generally like to leave branches about 2'' in length off of the main form branching. This will allow foliage to explode and fill in the space between structural branches, creating a wall of fresh, purple foliage - exactly what we are looking for! At some point during mid-June to early July, the new Spring growth will begin to stretch and become undesirable for form. At that time, it is beneficial to make the second prune. This prune should not be nearly as hard as the one the occurred in Spring but every branch should be pruned back, some hard, some not - depending on the look desired. This prune will expose some greener foliage and your Tree may not be as attractive for about two to three weeks but it will induce new growth and you will soon have the fresh purple foliage that is desired through the Summer. These prunes are strongly recommended each year. Also, remember to fertilizer with the Bower & Branch Elements - a big Tree that is kept small requires a little extra TLC! Grown and trained on an attractive 6' square trellis. 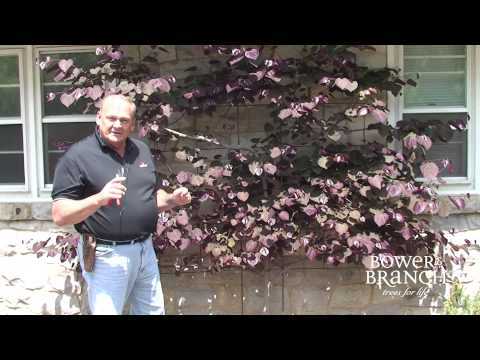 Espaliered Redbuds are grown flat for against the wall planting or a natural screen.